Spooky Tales from the Bible: The Necromancer of Endor | Is That in the Bible? It’s several days late, but one of my readers suggested a Halloween-themed article, so I decided to put the other one I was working on aside and take a look at the story of Saul and his visit to the so-called “Witch” of Endor in 1 Samuel 28 in order to summon the spirit of the prophet Samuel from the grave. There is no other story in the Bible like it, and the text poses one or two enigmas that scholars fail to agree on. Let’s take a look. To stay as close to the Hebrew as possible, I will use Graeme Auld’s translation (see bibliography) with a few minor changes, rather than a standard English Bible version. The story in 1 Samuel 28:3 begins with some brief exposition. 3 Now Samuel had died, and all Israel mourned him; and they buried him in Ramah in his town. And Saul had removed the bottles and the experts from the land. First, the text repeats what we were already told in 1 Sam 25:1: Samuel has died and been buried. Then we are told something new: Saul has banished from Israel “the bottles and the experts” (the obot and the yidde’onim) — an odd pair of terms that refers to bottles (obot) that function as a medium’s prop (like a crystal ball), and “experts” (yidde’onim) in secret knowledge. Auld believes this refers to human diviners who gain knowledge by using their “bottles” (Auld 325), while Blenkinsopp believes it refers to spirits themselves who possess the knowledge that the diviner seeks (Blenkinsopp 1995:13). Most English translations paper over the ambiguity and just say that Saul expelled the “mediums and wizards” or something similar. Leviticus (19:31; 20:6, 27) warns against using the obot and the yidde’onim, and both the deuteronomistic literature and priestly literature of the Old Testament appear to treat death cults as a threat to normative Yahwism (see ABD, “Ancestor Worship”). Our story, however, does not state what Saul’s own reasons for the ban were, nor how recently it was enacted. Most interpreters read it with the prohibitions in Leviticus and Deuteronomy in mind, but we cannot assume that those laws were in place when Samuel-Kings was written. Even within the traditional narrative, the law of Moses is “lost” until its accidental discovery in the time of Josiah. Isaiah 8:19 is critical of those who inquire of ghosts and spirits — which implies it is a common enough practice — but mentions no legal prohibitions. 4 And the Philistines were gathered, and they came and camped in Shunem, and Saul gathered every man of Israel, and they camped in Gilboa. 5 And Saul saw the Philistine camp; and he was afraid and his heart trembled greatly. 6 And Saul asked of Yahweh; but Yahweh did not answer him: by dreams, by the Urim, by the prophets. The Philistines are preparing to invade Israel, and Saul needs to know from Yahweh what will happen, so he attempts the acceptable methods of divination: dreams, the Urim (divination tools used by the priests), and prophets. All are silent. Saul will have to resort to less acceptable means if he wants an answer. The story takes a humorous turn. Although Saul has supposedly banished all the mediums from his land, his attendants have no trouble locating one when he asks. They call her a ba’alat-ob, or woman who commands the bottle (i.e. can conjure up ancestral spirits). Though many translations call her a “witch”, some scholars insist that this is a misnomer — particularly Esther Hamori, who has written a very informative book on the subject (see bibliography). The Bible has other labels for sorceresses and witches that are not used here. She is, rather, a “ghost-diviner” — a necromancer who seeks divine knowledge from the spirits of the dead. Furthermore, there is no reason to think she is anything other than an Israelite in this story, despite the biases of some interpreters to view any heterodox practices as Canaanite or foreign. Although this is the only direct instance of necromancy in the Bible, similar tales were common in Mesopotamian and Greco-Roman literature. The writer seems to be working from a basic story model, as Blenkinsopp shows (Blenkinsopp 2002: 49ff). Saul specifically asks for a woman, and though there is no particular reason a necromancer need be a woman, this seems to have been a stereotypically female occupation. Since ghosts usually don’t appear unbidden, the “mediation of a specialist and the application of certain necromantic techniques” is required to summon them (Ibid. 59). Furthermore, spirit divination almost always takes place at night, as the ghost must apparently depart before dawn (Ibid. 60), and so it is by night that Saul and his two attendants visit the woman. At this point in the story, Saul is still in disguise, and the woman does not know who he is. The fact that he swears by the name of Yahweh to her safety and she accepts it suggests that both are pious Yahweh followers. Here we encounter our first major difficulty. As the text now reads, events happen in the following sequence: (1) Saul names the person to be raised, (2) the woman sees Samuel, and (3) the woman realizes who Saul is. How could seeing Samuel possibly have made her recognize Saul? Keith Bodner remarks, “I find it utterly baffling how the woman perceives Samuel the prophet, and then immediately is able to identify Saul.” (Bodner 297) A number of explanations that deal with the text as-is have been proposed by scholars, none of them terribly convincing. Others believe the confusion is the result of redactional changes. Furthermore, the story seems to be out of order: the woman sees Samuel before the actual rising of Samuel two verses later. 14 And he said to her, “What was his form?” and the woman said, “an old [LXX: erect] man rising, and he is wrapped in a robe.” And Saul knew that it was Samuel; and he knelt face on the ground and did obeisance to him. Unfortunately, the story skips over the part many modern readers are most interested in: a description of the ritual itself. It may be that the author himself didn’t know exactly how necromancy was carried out. Whatever her methods, the woman is successful, and there’s plenty to unpack in these two verses. The mention of “gods” rising is curious. English translations generally obscure the Hebrew phrasing (e.g. the NIV: “I see a ghostly figure”), but the word is elohim and the verb is plural. Isaiah 8:19-20 also, perhaps ironically, refers to the dead as gods: “Should not a people consult their gods, the dead on behalf of the living, for teaching and for instruction?”. Brian Schmidt, on the other hand, suggests that the gods are not the dead themselves, but chthonic deities summoned to assist the retrieval of the ghost, as is attested in Mesopotamian traditions (Schmidt 90). The fact that the spirits rise from the ground is consistent with the ancient Near Eastern view of the cosmos, according to which the netherworld, where the spirits of the dead rest, is located under the flat earth. The Old Testament frequently speaks of the dead going down to Sheol, where they are forgotten by Yahweh (Psalm 88:10ff, Eccl 2:16). We are not dealing with Samuel’s physical body rising from the gravesite, since that is in Ramah, a location far removed from Endor. Many commentators (but not Hamori) somehow fail to notice that the spirits are visible only to the woman and not to Saul, though Samuel’s ghost can speak to Saul and presumably anyone else in the room. This might be a common expectation when the dead are summoned, if for no other reason than that all such rituals would have involved some level of fakery by the medium — just like a modern-day seance or psychic reading. Nevertheless, the author appears to believe in necromancy and depicts the event as a real conjuring of a ghost. Saul’s recognition that the ghost must indeed be Samuel is somewhat contrived. The only description given by the medium is that the figure is an old man wearing a robe. Obviously that’s not very specific. The logic seems to be that this description is consistent with that of Samuel (whose is described as wearing a robe in 1 Samuel 15:27), so there is no reason for Saul or the narrator to doubt that the medium has summoned Samuel as requested (Hamori 122). This detail also reflects the view of ancient Jews and others that one’s ghost was an anthropomorphic mirror-image of the person during his or her life. Samuel was an old man who wore a robe; therefore, his ghost is also an old man who wears a robe.² Similarly, Odysseus is able to recognize the souls of all his comrades when he descends to Hades, because they look the same (Finney 62). The similarities also go beyond the visual. Samuel’s ghost speaks Hebrew and has the same personality (including his hatred of the Amalekites) that the living Samuel had. It should be obvious, but it bears mentioning that nothing in the story hints even in the slightest that Saul is conversing with anyone other than the real ghost of Samuel. Since the early church fathers, however, Christians have been disturbed enough by the passage to insist that it was really a demon masquerading as Samuel. (Accepting the implications that necromancy really works is out of the question, apparently.) In my experience, this is still the standard explanation trotted out in church and Sunday school. We can safely discard such interpretations as the attempts of fundamentalists and biblical inerrantists to get out of a tight spot. The spirit of Samuel is upset at being disturbed. This is apparently in keeping with the convention of literary ghost stories (Blenkinsopp 2002: 56). 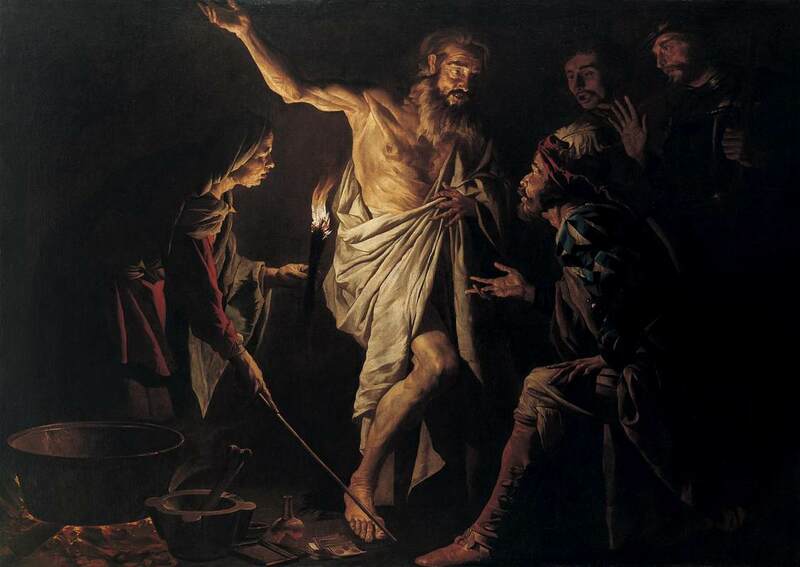 However, he does not condemn Saul for using a medium to summon him from the grave. For the most part, he simply repeats, rather verbosely, the verdict he made earlier: that Saul will lose his kingdom for not completely destroying the Amalekites as commanded. It is widely believed that verses 17-19a were a later addition to strengthen the connection with chapter 15, where Samuel first declares Yahweh’s punishment on Saul for his failure to obey. In ancient tales of this type, the dead person usually makes some kind of prediction on behalf of the living. How much do the dead know? It’s not clear if Samuel’s knowledge extends beyond the outcome of the upcoming battle (Ibid. 60). After this brief pronouncement, the encounter ends. The medium shows great kindness toward Saul, baking bread and butchering her own calf to feed him and restore the strength that he has lost from his fast. The reader may be surprised that contrary to what we might expect from a witch or necromancer according to other Bible passages, this woman is not only competent, but kind and generous. No hint of criticism toward her or her craft can be found in this story. Contrary perhaps to what many modern readers think, the story is not really about necromancy, and it does not condemn Saul for resorting to such measures, nor the medium for carrying them out. Rather, the story continues a theme found elsewhere in the story of Saul’s reign: that he has lost Yahweh’s favour and can no longer obtain advice from his own deity, even though his rival David does so with ease. The visit to the necromancer adds dramatic irony, as Saul is forced to resort to measures he himself has outlawed. Only the lowly medium, an outcast of mainstream society due to Saul’s own actions, can deliver Yahweh’s message to Saul, and in the end, we see him a broken and powerless man. I mean, if you think about it, it’s absurd to suppose that when a person dies, their soul is issued ghost-clothes that look exactly like what they were wearing when they died. Keith Bodner, 1 Samuel: A Narrative Commentary, 2009. Graeme Auld, I & II Samuel, 2011. Philippe Wajdenbaum, Argonauts of the Desert. M.L. West, The East Face of Helicon: West Asiatic Elements in Greek Poetry and Myth, 1997. Blenkinsopp, “Deuteronomy and the Politics of Post-Mortem Existence”, VT 45/1, 1995. Brian B. Schmidt, “Memory as Immortality”, Judaism in Late Antiquity 4: Death, Life-After-Death, Resurrection and the World-to-Come in the Judaisms of Antiquity. Mark Finney, Resurrection, Hell, and the Afterlife: Body and Soul in Antiquity, Judaism, and Early Christianity, 2016. Esther J. Hamori, Women’s Divination in Biblical Literature: Prophecy, Necromancy, and Other Arts of Knowledge, Anchor Yale Bible Reference Library, 2015. Graham Harvey, “The Suffering of Witches and Children: Uses of the Witchcraft Passages in the Bible”, Words Remembered, Texts Renewed, 1995. Another possible parallel can be found in chapter six of astra polemos, where a fiery ritual dance at Endor includes the appearance of three ghostly figures in cloaks – though this was later redacted so that one of the figures was made to be much younger than was portrayed in the earliest versions of the story. Can you elaborate further, Travis? I’m not familiar with that one. Hah! Can’t believe that one went over my head at first. I had a look at the text to see if ותרא ever appears as a form of ירא. I haven’t found one in the 2/3 of the Bible I have so far read. I checked the full list of 31 times that these four letters ותרא appear and none of them is read as a form of ירא. This is an elaborate story and I think you have identified its intent. But I don’t myself see a sequence problem in the story with the woman first ‘seeing’ Samuel, i.e. remembering her image of Samuel ‘in her mind’ and then recognizing the compromised psyche of Saul. I’m sure your Hebrew is better than mine, but Hamori points to verse 5, where the verb is defectively spelled that way. Better or not – you are quite right. I missed what was in front of my face. I have not yet read about half the 31 instances and here my algorithms guessed saw rather than feared. And I followed the computer’s lead. (I am in a hurry to finish – but I still have just over 300 chapters to read in Hebrew – at least another year or two). and he saw and his heart was very apprehensive. 2. Might the Transfiguration also be viewed as (benign) necromancy? Interesting question about the Transfiguration. I think the idea there is that Moses (in some traditions) and Elijah did not die but ascended to Heaven, so instead of being stuck in Sheol/Hades, they can make surprise guest appearances, as in the Transfiguration and as the two witnesses in Revelation. While the story doesn’t give any direct criticism of this kind of necromancy, what was Saul’s motivation for banning the practice? That would seem to imply it was held in low regard by at least some of Israel. I agree, but we can only speculate. The only purpose for mentioning it seems to be to set up this story. I am wondering how original the necromancy element is. If the writer had a version where Samuel condemns Saul directly, or Samuel, as previously, conducted the divination to find out Yahweh’s will, but had to harmonise this with a version where Samuel has died already, he may have had to come up with a ‘back from the dead’ explanation. Also, the writer seems to be working from some material suggesting the kings can directly divine Yahweh’s will. David can, and there is the seemingly proverbial ‘Saul among the prophets’ for which he provides an obscure origin story. in which case the Bottle necromancer may be an addition the story. Are we thinking the writer is a contemporary of Homer and Isaiah and operating in a similar iron-age cultural mindset? Why, in all these stories, do those who believe in prophesies alway make sure they do everything to make them happen? Didn’t just one person who heard their death prophesied think, “Well, I’m not doing that tomorrow then.”? And if they couldn’t doesn’t this declare free-will non-existant? Heh, that’s a very good question. Prophecy doesn’t seem to affect anyone’s actions within the story; it’s there more as a literary device to emphasize that Yahweh has ordained the outcome because of his preference for David over Saul. “Free will” is something that modern interpreters are very interested in, and certain theological viewpoints rely heavily on it, but I don’t see that concept ever being raised in the Bible. If anything, the Bible is full of stories denying free will. Yahweh has no problem “hardening the hearts” of people and making them act against their own will. Much appreciated post! Thank you. Furthermore, spirit divination almost always takes place at night, as the ghost must apparently depart before dawn (Ibid. 60), and so it is by night that Saul and his two attendants visit the woman.